Limited Edition of 1500 prints, 20" x 29", 2001. 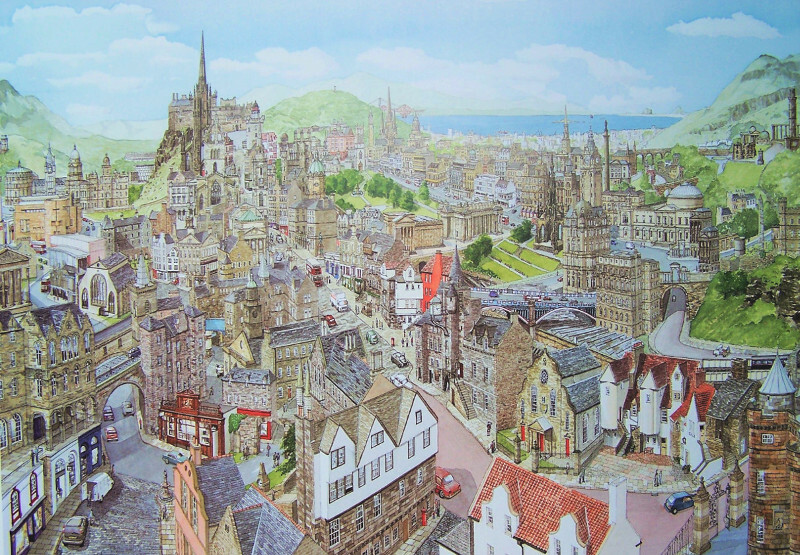 This was my first Scottish adventure, and I headed for the capital city as I had received many requests for an Edinburgh print over the years. In January 2001 I booked into a city centre hotel and spent several frantic days walking the dramatic streets of the capital whilst dodging the poor weather I had chosen! I managed to capture the images I needed for my Edinburgh painting on film, augmented by a mini library of books and pamphlets, and headed back to my studio in Wales to start the first cityscape painting in my new home. The composition was already in my head as the Edinburgh cityscape had such strong elements; the Old Town, the Royal Mile and the Castle, the New Town, Arthurs Seat, Calton Hill, as well as long views over the Firth of Forth. There were gems around every corner like Victoria Street with its multi coloured shops descending along a curved sett street, the stone of Holyroodhouse Palace changing colour with the light, the closes dropping away from High Street, not to mention the set pieces such as the Castle, the Galleries, Scott Monument, Register House and the classical splendour of New Town buildings. They would all have to find a place in my Edinburgh print. Yes this was an ideal candidate for one of my cityscape paintings, but it still took me seven months to complete. Naturally with such a beautiful city, there were many Edinburgh prints on the market but fortunately for me there has proved to be space for my unusual style.